Tradition! Tevye shouts in the beloved musical Fiddler! We are all connected to our past; to our histories; to our families. Tradition is the glue that binds us together, making us who we are, whether we want to admit it or not. There is something about the sameness of an annual event — our traditions — that are familiar and I think, are comforting. At our house any family gathering that involves food is filled with traditions: Jeffrey’s Kiddush cup and his grandmother’s tablecloth and silver candlesticks; my mother’s handmade gravy boat and soup tureen; Aunt Carrie’s cut glass fruit compote; Maxine’s silver platter; my sister’s napkin rings. Everyone is represented. They are with us. To veer from any tradition can have the potential to cause a seismic emotional shift, if we change something that is tagged to that comfort. So as the head non-Jew in charge of the Passover menu in my family, it was a big challenge to approach, with justifiable trepidation, the camouflaging of the Gefilte Fish – to make it into something that looked even remotely edible. Ah… Enter Martha Stewart, with whom I’ve developed a symbiotic relationship over the years. Through her I discovered what I hoped would be a more palatable recipe for the dreaded Gefilte Fish, made from poached Salmon rather than Pike. (Who sells pike these days, I ask you!) Some family members said why do you bother – just buy the kind in the jar. But making the effort, going to the trouble to prepare all these special things is part of the tradition, just as our mother’s did for so many, many years. That’s the point and it’s my pleasure. Last year I worked up the courage to replicate Martha’s recipe using Salmon and we were all surprised to find that it wasn’t that bad. That’s not to say that the plates were are all scraped completely clean when they were returned to the kitchen, but I thought it was an improvement. Not so sure the traditionalists agreed…but then, we are a blended family. This year I’m adding it to the menu again, in the hopes that it comes our tradition, but I’ll keep my ear tuned to any emotional discomfort that results. Bon Appetit! Buona Mangia! l’Chaim! Enjoy! Tradition! Here’s my menu: Eliza’s Chicken Liver Pate; Tillie’s Matzo Ball Soup with plenty of dill and parsnips; Martha’s Tureen of Poached Salmon; Eliza’s Brisket roasted with Onions and Brandy and Roasted Root Vegetables; Ruthie’s Stewed Compote of Apricots, Pears, Figs, and Raisins; Jeffrey’s Verona Salad of Cabbage, Cucumbers, Peppers, Onions with Sweet Lemon Vinegar Dressing; and Ilene’s Flourless Cakes for desert. *…with apologies to Lieber and Stoller’s 50s hit. Creating a weblog is an interesting experience. It’s a leap of faith actually, that someone other than me might be interested in what I’m thinking and would be willing to open up a conversation. Before I retired to Southern California I wrote a blog for my company. It was unexpectedly satisfying. Being a perpetual student, I’ve always been insatiably curious about everything – so I love the research aspects that come along with learning about new things. At our house, “Google it!” is an action phrase. I’m naturally inclined to share my discoveries with my friends, whether it’s a new restaurant, a great play or learning the derivation of an odd phrase. So for me, writing about such things becomes an extension of every day communication. I spent the first year or so of retirement wondering how I could gracefully make the transition to not going at top speed twelve hours a day — and not being engaged in something relevant. Clearly, that transition was and still is a challenge – a work in process. My brain needs to be engaged! More than one person suggested that I write. “What about creating a review type blog about restaurants in our community?” someone asked. That resonated, but I thought the subject ought to embrace all kinds of cultural experiences that enrich our lives and make us smile, not just restaurants. Thus was born, La Bella Vita. We baby boomers are indeed experiencing The Good Life. I have no way of knowing who you are, if you don’t talk back. The goal is not only to inform but to also engage you, and hopefully entice you to respond. Make a comment, agree, disagree, like, don’t like, bring another element to the topic at hand. Without you it’s not a conversation, it’s a sermon, and that’s not very interesting. At least, it’s not what I hope to accomplish. Passing the blog on to others that you think might find it interesting/enjoyable would be nice, too. Sometimes it feels like it’s dark outside and I’m shouting out the back door…”Is anybody out there?” I’d like to continue what I’ve started, so a word from you would be helpful. Please be assured that if your format requires a log-in for commenting, it’s for one reason only: to avoid spammers and people who are negative or disruptive. Your e-mail is completely protected through the WordPress Security System and will not be shared with anyone. Being relatively new to the Coachella Valley cultural vibe, I’ve been anxious to experience what community theater has to offer. Being in such close proximity to Los Angeles, I expected to find talent itching to flap those theatrical wings and right I was. I’m not talking about the big tour shows that hit the McCallum Theater during the season (like Mama Mia which was here last weekend) or the other performing arts venues like LaQuinta Grooves in the Grove, or the Coachella Music Festival. That about sums it up. This delicious romp through Broadway history with its satirically rousing numbers like “It’s A Privilege To Pee,” lampoons musical theater in general, with absurd over the top characters like the “Our Town narrator,” Officer Lockstock and his trusty sidekick, officer Barrell. Did I mention the “Les Misérables” first act ending, complete with waiving red flag and two-step choreography. The singing was respectable and in some places pretty darn good, with rousing harmonies struck at the end of each song; the choreography was better than one might expect from a local production; costumes and set decoration were convincing and overall, the show was good old fashioned light entertainment. We all enjoyed the escape from reality, while supporting our friends Bonnie & Roger Grace, who had parts in the show. In the end, that’s what it’s all about anyway. Community theater is a labor of love. We do it because IT’S FUN, and we love to support our friends. It’s a grand opportunity for discovery, whether you’re creative and handy enough to build a set, learn to sing harmony or maybe tap dance (I’m waiting for someone to do 42nd Street so I can learn to do that,) sew costumes, or even tackle a leading role. Hey, it could happen! Alfie Boe , the recent lead in the London production of Les Misérables was a natural talent who was pretty much destined to remain a mechanic until he was nearly plucked from obscurity to sing with the D’Oyly Carte Opera Company and the rest, they say, is history. I did a google search of local community theater, and the results were pretty scattered. As far as I can tell, there are three local theater groups which you absolutely should explore: the above mentioned Palm Canyon Theater, the Coachella Valley REP, and The Indio Performing Arts Center, with Artistic Director Bob Reinhagen, who is my old friend and actually the first director I worked with, back in our Falmouth Theater Guild days on Cape Cod. A life time ago, but what fun we had – building sets, playing in the orchestra, singing in the chorus, making costumes, occasionally taking a speaking role. Micky and Judy had nothin’ on us! But I am betting there is more local theater, which I hope you will tell me about. So please do, by clicking reply. I”m all ears! Trio is uptown – in the Uptown Design District of Palm Springs. part architectural landmark in mid-century modernism. On the night we visited, we were headed for a local community theater offering, so our reservation was for 5:30. Good plan. Within a half hour of our arrival patrons were packed in like sardines. No matter. Our trio of servers moved like a well orchestrated dance team navigating between the tables as they showered us with just the right amount of attention. The pre fix menu was well designed yet interesting – a trio of pairings for a surprising $19. My white bean humus with Kalamata olives and crostini, was followed by Australian sole, paired with Israeli couscous – all perfectly prepared. Our entire party finished with a chocolate bread pudding that had us swooning. Other choices at our table included: falling off the bone spare ribs paired with perfectly crisped sweet potato fries; an adult mac & five cheese dish, tricked out with bacon and scallions; and an elegantly stacked, mouth-watering Portobello, eggplant, carmelized onion, veggie burger. Happily none of our servings were overwhelming – like Goldilocks, they were just right. Kudos to owners Tony Marchese and Chef Mark Van Laanen, who have created “comfort food with a contemporary flair,” sacrificing nothing in the process. They have a green commitment to be sustainable, organic, and natural whenever possible. Just proves that you can do it and still thrive, if you want to. Their current “special Dinner and a Show” offering combines great food with support for neighbor Palm Canyon Theater which is currently featuring Urinetown. (review to follow) Check Trio’s website for the dates that apply. In a word, Trio was satisfying. I’m looking forward to our next visit. 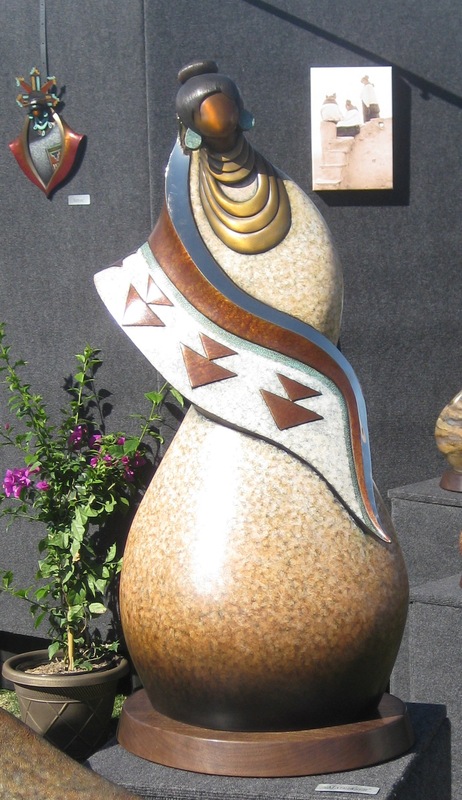 The Coachella Valley has always been known to inspire artistic expression – it’s a magnet for galleries and the home of artisans of all types who find the weather and desert setting conducive to creativity. As a writer I see the valley’s subtle beauty at every turn and it makes me want to find new and different ways to express myself. The Southwestern Art Festival, which concluded several weeks ago was just one of a series that we get to enjoy during the high season. 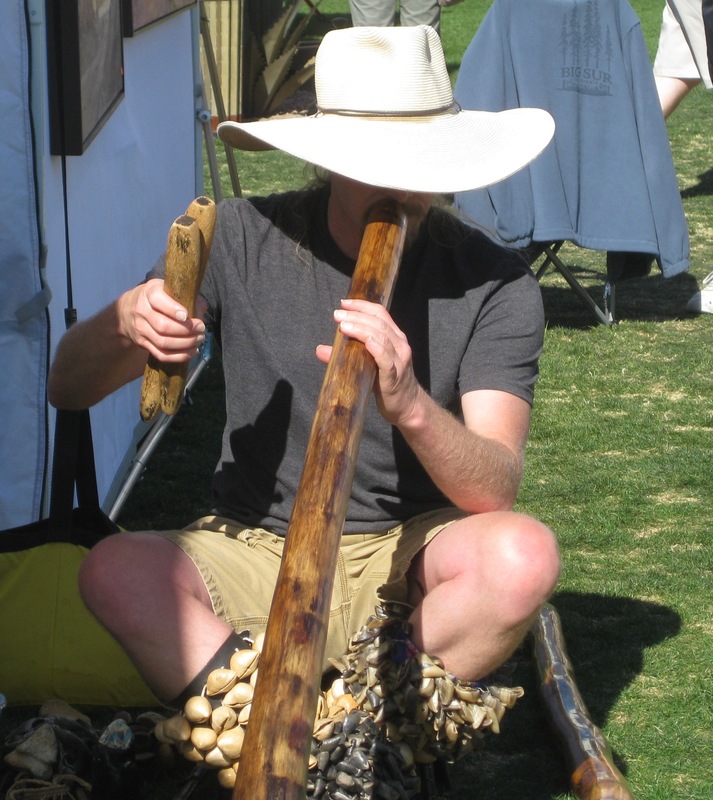 Above, making music with a didgeridoo and calf slapping sea shells. If you don’t know about this aboriginal instrument, click here and have a listen. The Indian madonna on the right needs no explanation. It’s simply beauty. Perhaps garden art is more your thing. 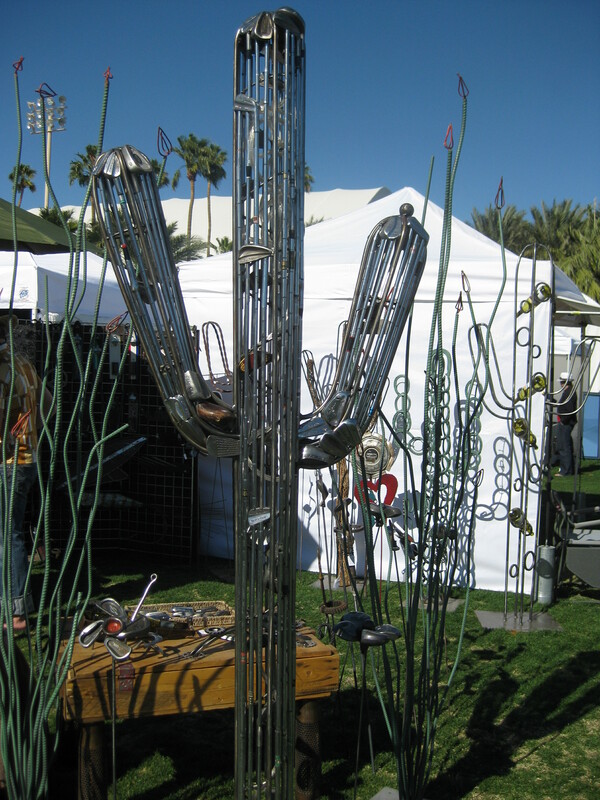 The cactus on the left is made entirely of golf clubs. A better use for them? The palm tree on the right will never ever need water, just a little polish if you want to keep it shining. Perhaps you will find these extreme examples of what was offered – of course there were the myriad traditionalists painting their desert landscapes and flower arrangements, but these examples remind us that art of all kinds, is in the eye of the beholder. The point is, the viewer is bound to find something pleasing, no matter what your taste. 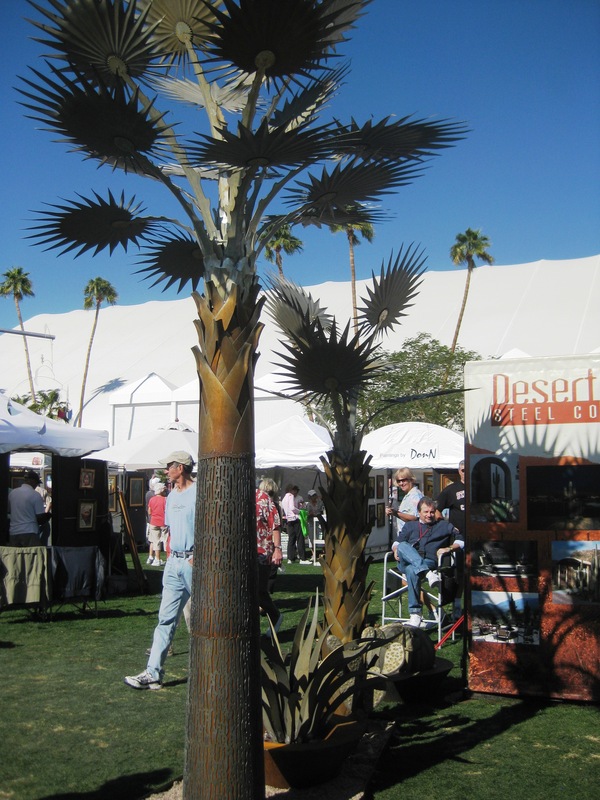 If you missed the Southwestern offering, you can still enjoy LaQuinta Arts Festival March 8-11 and Indian Wells Arts Festival April 6-8. Or do the art galleries on El Paseo in Palm Desert anytime – or head over to Palm Springs and do the same on South Palm Canyon. On a recent visit to several of the galleries on El Paseo we were delighted with everything from whimsical animal statuary to exquisite oils that unexpectedly transported us to the Italian countryside. You just have to get out and see the world with fresh eyes.